But what do we buy for the boys??? Nonfiction on a topic that interests them is always a good bet, but here are some other suggestions, too. Wanna know our most popular requests from little guys at the library? 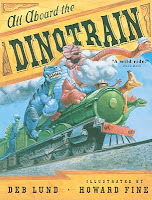 Trains , quickly followed by dinosaurs. How lucky that there are a couple of books that COMBINE THE TWO. 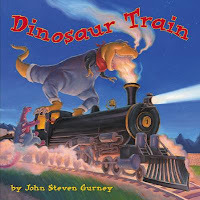 If you want to be a Story Hero in the eyes of your little guy, consider All Aboard the Dino Train by Deb Lund and Dinosaur Train by John Steven Gurney. 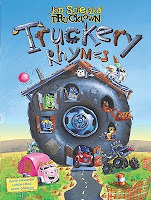 Truckery Rhymes by Jon Scieszka. Jon Scieszka's Truck Town books have been a huge hit with the kids at my library. Bright pictures and funny text feature trucks, trucks and, well, more trucks. This is perfect for the vehicle enthusiast on your list. And speaking of our Ambassador for Young People's Literature, you also shouldn't overlook his The Stinky Cheese Man and Other Fairly Stupid Tales. Written by Scieszka and Lane Smith, this is a great choice for elementary students with its wacky, irreverent humor. When I broke it out in After School Adventures, they begged me to read story after story. Another a uthor wildly popular with boys at my library is David Shannon. A particular favorite seems to be No, David! 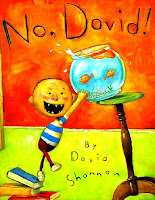 When David breaks all the rules, he's constantly hearing "No, David!" Exuberant illustrations accompany simple text that'll have the boys giggling for sure. 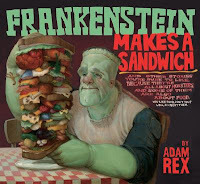 Frankenstein Makes a Sandwich by Adam Rex is another great choice for elementary kids. From Frankenstein to zombies to the Phantom of the Opera (who can't get the song It's a Small World out of his head), all kinds of monsters appear in the humorous poems within this book. Can't get enough? Make sure you pick up the sequel - Frankenstein Takes the Cake. Annnd I' m back to Scieszka (what can I say? He's awesome!). Knucklehead by Jon Scieszka is a mostly true story about Jon's childhood growing up with five brothers. It's laugh-out-loud funny and the short chapters and photos included will appeal to reluctant readers as well as voracious ones. Read my full review of Knucklehead. The number one most requested children's book at my library? Diary of a Wimpy Kid by Jeff Kinney. Hands down. The newest installment, Diary of a Wimpy Kid: Dog Days, just came out in October and makes a perfect gift. Pair it with the Diary of a Wimpy Kid Do-It-Yourself Book or a journal of your choice to fan the creative spark within. If you're buying for a guy who loves action-packed tales, look no further than Percy Jackson and the Olympians. With the movie coming out in February, there's no better time to get your guy started on this excellent series. Start with the first book, The Lightning Thief, or go hog wild and get this nifty Percy Jackson and the Olympians boxed set. Pair it with a promise to see the movie together when it comes out. Can a book about cancer be funny? It can when it's by Jordan Sonnenblick. Drums, Girls, and Dangerous Pie is one of my all-time favorites. Steven's minding his own business, playing the drums and crushing on a hot girl at his school when his five-year-old brother is diagnosed with leukemia and everything changes. What could be a truly depressing storyline is treated with Sonnenblick's incomparable humor. It's a story with a lot of heart and a lot of laughs. If you'r e buying for a guy who likes his books on the scary side, take a look at Skeleton Creek by Patrick Carman. To be completely honest it's been almost a year since I read Ryan's story about what happened at the dredge and it still gives me the heebie-jeebies. The text is linked with online videos that continue and add to the story, giving a unique element to the story. Wolf Brother by Michelle Paver is another one of my all-time favorites. This is an action-packed story set in prehistoric times. When Torak's father is killed by an evil spirit bear, Torak is charged with saving the world. Only... he has no idea how to go about doing it. Thus begins the first book in the Chronicles of Ancient Darkness series. 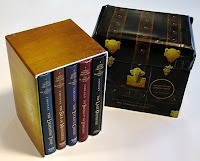 Find more ideas for the guys on your holiday gift-giving lists at Guys Lit Wire (for teens) and Guysread.com. My library received Truckery Rhymes in October and I don't think it's been on the shelf since. Boys definitely love it! Great list, Abby. 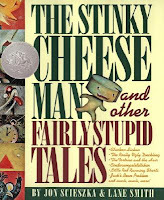 The Stinky Cheese Man was always a family favorite. And I just finished Drums, Girl and Dangerous Pie and loved it - proving it a great girl book too. You rock, Abby! My 11 year old LOVES Diary of a Wimpy Kid, Percy Jackson, and Skeleton Creek. Awesome titles from an awesome librarian!